Dr Stuart Parkinson, SGR, outlines plans for a huge increase in funding from the European Union for military R&D - and discusses how it can be challenged. However, this is just the beginning. In June 2017, the European Commission officially launched a new European Defence Fund. Current proposals for this fund, if accepted by Member States and the European Parliament, would rapidly expand the EU funding available to the arms industry. Specifically, spending on military research, development and related activities would increase to at least 1,500 million euros per year (m €/y) from 2021 onwards – 50 times the current level. And it is important to understand that this funding is additional to the large budgets already provided by national governments in Europe for military R&D. How did the European Union – a civilian organisation and recipient of the Nobel Peace Prize – come to this? And how can it be challenged? Growing integration of the economic and political systems of EU nations in civilian areas has, over the last couple of decades, led to increasing links between the EU and European arms corporations, not least in R&D. This has taken place in two key areas: the emerging ‘security’ sector, which is focused on technologies for law enforcement; and ‘traditional defence’ work. The EDA has run numerous small industrial collaborations since 2004. However, it was not until 2016 that it launched its first research programme, awarding 1.4m € to three projects focused on innovation in aerial drones and ‘urban warfare’ technology. The progress made with this programme in its first few months was deemed sufficient to lead to the rapid approval of the PADR – with a 20-fold increase in annual spending. Then, just six months on from the approval of the PADR, the proposals for the European Defence Fund were launched including requests for further massive increases in funding. The structure of the fund is shown in Figure 1. It is planned that the PADR would form the research segment of this fund. 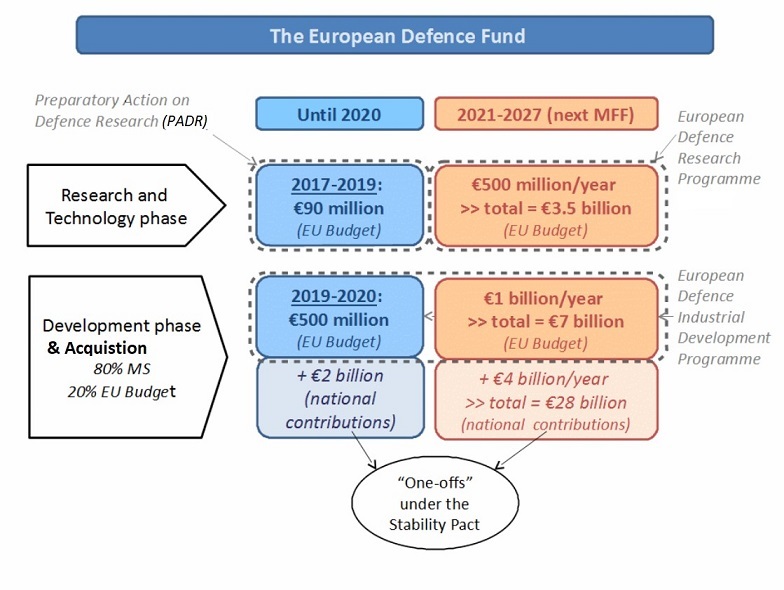 From 2021, the PADR would expanded into the European Defence Research Programme, with EU funding of 500m €/y up until 2027 (the end of the next EU budget period). This funding would be focused on basic and applied research in universities, public research institutes and corporate laboratories. In tandem with this, the European Defence Industrial Development Programme would be set up, initially with EU funding of 250m €/y from 2019 to 2020, rising to 1,000m €/y from 2021 to 2027. The focus of this programme would be to carry out development work and assist armed forces in the EU with the acquisition of the new military technologies. Hence the total EU funding per year for military research, development and acquisition assistance would total 1,500m €/y from 2021 to 2027. On top of this EU funding, Member States would be expected to provide additional direct funding to these programmes, multiplying them further (see Figure 1). A key priority for the first research projects being funded under the PADR are robotic systems, especially military drones  – and the signs are that such technologies will be a priority under the European Defence Fund in general, despite their highly controversial nature. The proposed rapid growth of EU funding for military R&D is startling, but the European Defence Agency argues it is necessary. It has compiled data showing that national governments within the EU spend, in total, approximately 8,800m €/y on military R&D  – a very large amount. However, the EDA is quick to point out that its figures show a real term fall of 1,900m €/y from the 2006 level, before the global financial crisis. Hence it is lobbying hard for the European Defence Fund to at least make up the difference. To reinforce this argument, it points especially to growing Russian militarism, not least the takeover of Crimea in 2014. Although the PADR is now underway, there is still time to challenge the level of funding planned for other elements of the European Defence Fund. The next decision to be taken is on the size of the budget for the European Defence Industrial Development Programme for 2019 and 2020. In particular, the European Parliament is likely to vote on this in March or April 2018. Decisions on funding for programmes from 2021 onwards are likely to take place in late 2019. UK citizens will obviously be able to have a say in 2018 decisions but, if Brexit proceeds as planned, this will prevent direct input after early 2019. Nevertheless, there would be opportunities to support campaigners within the EU after Brexit happens. Which arguments are most likely to influence MEPs and other European decision-makers? First, let’s consider national defence, especially with regard to Russia. Although Russia’s military spending has increased markedly over the last decade, the total it has spent during this time has been only one-fifth that spent by EU countries. And economic pressures – including EU sanctions following the invasion of Crimea – mean that that spending is likely to fall in the near future. This dominance is mirrored in military equipment, with the European members of NATO having force superiority over Russia in nearly all conventional weapons systems deployed – from battle tanks to warships. So it is hard to see a convincing argument for the European Defence Fund based on national defence. But the arms industry already receives numerous large subsidies from national governments – such as export guarantees and R&D funds. Furthermore, there is significant evidence that civilian industries are generally more beneficial in terms of economic performance and job creation. Indeed, there is a major question mark over whether the arms industry contributes as much to the R&D activity of the EU as EDA figures indicate – see Box 1. Hence it is hard to see the economic justification for yet more public financial assistance for the military industrial sector. Box 1 – European military R&D spending – whose figures are right? The European Defence Agency claims that the national governments in the EU, in total, spend about 8,800m €/y on military R&D. However, Eurostat – the EU’s statistical agency – has published very different figures, which are summarised in Table 1. Its total is approximately 4,600m €/y – just under half the EDA estimate. Which should we believe? In compiling its figures, Eurostat uses strict classifications of research and development, known as the ‘Frascati definitions’. These are internationally agreed so that robust and consistent statistics can be compiled for different organisations and countries. Unfortunately, EU defence ministries tend to compile two sets of R&D figures  – a Frascati-compliant set and another set which uses much broader definitions of R&D (including later stages in the commercialisation process). The second set is the source of the EDA figures. Hence their estimates are much higher. This can give the impression that the military industrial sector is more valuable in terms of R&D than other civilian sectors. This would be a misleading perception. To support the campaign against the European Defence Fund and its constituent programmes, SGR has joined with other European campaign groups to set up the Researchers for Peace website, https://www.researchersforpeace.eu/ Here, researchers from universities, public research bodies and industry are invited to sign a statement opposing the fund. We also encourage you to write to your MEP as soon as possible, making some of the points in this article. Dr Stuart Parkinson is Executive Director of Scientists for Global Responsibility, and has written extensively on military involvement in science and technology. pp.75-95 of: Holden P et al (2016). Indefensible: Seven myths that sustain the global arms trade. Zed books. Section I.3 of: ENAAT (2017) – see note 14.